Southern Star Brewing has announced their annual Oktoberfest party at the brewery will be held on October 22nd from 6pm ~ 10pm. 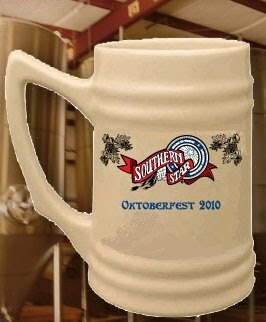 The price is $30 per person which includes a 17oz commemorative ceramic beer stein and 5 tokens for beer. They'll be pouring their regular lineup of Blond, Pine Belt and Hatchet and other beers such as the 2011 Pro-Am may or may not be available as well. Food will be available for purchase (cash only) from The Outlaw Kookers and the Folk Family Revival band will be providing the entertainment. Tickets can purchased online and only 300 will be sold, so I wouldn't wait too long if you're thinking about going.